My name is Piri. 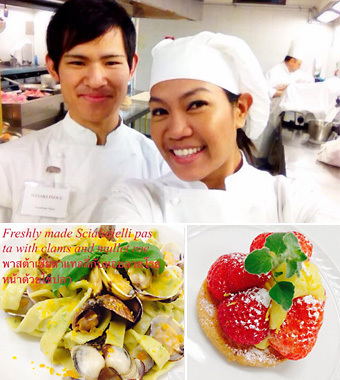 I’m the first Thai student of Academia Riaci in the Culinary art for professional course. I’ve been flying for a living with Emirates airline as a Flight Purser for many years. Travelling and food have always been my passion. As I’m fond of cooking and learning new languages, I started searching for a school that can help me fullfilling my dream. And for some heaven sent reasons, Academia Riaci just popped up on my laptop screen. My heart was racing joyfully when I read through every page of its website. Wow… Living and studying what I love the most in Florence seems like a dream to me. Please allow me to be honest with you. Studying 6 days a week is tough. Learning and trying to speak a new language and gaining new skills are not as easy as peeling a banana. However, one thing I can reassure you jow is it’s worth it. And of course, as it’s my passion, I walked along river Arno to school, still smiling happily to myself. I looked forward to every lesson. Professor Francesco who is our culinary teacher is a guru in Italian food. My jaws dropped when I tasted his food and listened to the fascinating stories behind each dish. I love baking pasta and baking desserts. The smell of cakes from the oven is comforting and telling me that life is great. Enjoy the moment and live it beautifully. Our Italian class is as well so much fun. My Italian is improving better and better every day. Teacher Milli is very kind. However, I’m not allowed to speak English to her. So I have to talk to her in my “Limited edition” Italian. I guess pushing myself through the limit and with a great support from everybody, I started to understand Italian more and more. Today is the first day of our wine sommelier class. I’m very excited. We went to visit the vineyard the other day and it was just amazing. I’m positive our sommelier lessons will be amazing again.